Pro Se Productions, a leader in Genre Fiction and New Pulp publishing, announces today plans for the first volume in its newest imprint, PULP STUDIES. Noted New Pulp Author I. 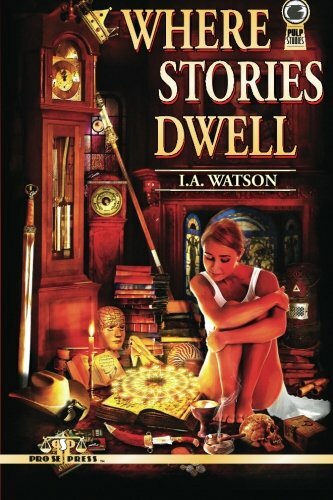 A. Watson analyzes and discusses interesting and often unknown points of history, fiction, and more in a collection of essays that, as the title suggests, looks at sources of the tales that have fascinated readers, and even listeners, for years, decades, and centuries. WHERE STORIES DWELL is a volume in Pro Se Productions’ PULPSTUDIES imprint. This line is focused on bringing titles to readers that either reveal wonderful facts and figures to aspiring writers and hungry fans or look and delve into the stories that make up what is New Pulp today. Featuring a fantastic cover by Jeffrey Hayes with logo design by David Foster and print formatting by Sean Ali, WHERE STORIES DWELL is available at Amazon and via the Pro Se Store at http://tinyurl.com/mwzzre7 for $15.00 in print. This collection, featuring the digital formatting of Russ Anderson, is also available as an Ebook at Amazon, Smashwords, and Barnes & Noble for $2.99. For interviews or more information on WHERE STORIES DWELL, please contact Morgan McKay, Pro Se’s Director of Corporate Operations at directorofcorporateoperations@prose-press.com.